It's yellow. It's orange. It's sleek. It's funny. It's the Oscar Mayer Wienermobile. Did you happen to notice it driving around town on Friday, November 18th? It wasn't selling wieners or other Kraft products that day. It was doing food runs for Food Runners: picking up excess food from businesses and delivering it to agencies serving those in need. Good deeds come in all kinds of packages. Traci called the week before. She and the Wienermobile were to be in San Francisco for a day and she wanted to do something special. She found Food Runners on the internet and she picked up the phone. Food Runners did the happy dance upon receiving her call. Volunteers are always welcome, especially the Friday before Thanksgiving when many of the regulars are on their way out of town. A chat and a few email instructions later and the fun began. First stop: Veteran's Equity Center. 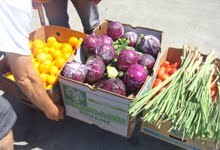 Every Friday, Veteran's Equity donates fresh produce leftover from their Thursday evening food pantry. Sometimes, pantry clients take all the food. Most times, they don't. Enter Food Runners. Enter Traci, her partner Yoli and the funny car. Food on board, the Weinermobile headed over to St. Gregory's Church in the Potrero district to make the delivery. The folks at St. Greg's scratched their heads when they saw the hot dog on wheels pulling up. Probably a mistake they thought until Traci and Yoli popped out announcing a delivery from Food Runners. St. Greg's staff and volunteers unloaded with a grateful chuckle. After St. Greg's, the fun careened toward Union Square for the usual Friday afternoon pick up at Justin TV. Serena at Justin had a good laugh when she arrived curbside with her cart full of leftover in-house lunch. Follwoing the pick up, the Wienermobile headed out Geary Street to Thrive House in the Western Addition. Thuy at Thrive had her camera ready and couldn't wait to show the kids who would be arriving shortly for their after school program for which Food Runners provides a delivery every Friday. Traffic thickened in the afternoon sun, but that didn't daunt the stalwart Traci. From Thrive House, she continued on her mission soon arriving at Twitter in SOMA. Chef Lance presented Traci and Yoli with the usual big load of excellent leftover lunch o' day from Twitter's corporate cafeteria. Final stop: Columbia Park Boys and Girls Club in the Mission where the kids came out to get a glimpse of the Weinermobile. Columbia Park staff received the food gladly knowing that not only would some hungry bellies get much needed food, but in addition, the kids would be exposed to healthier, more nutritious foods than they might normally eat. A win, win for all. Yoli and I had a wonderful time running around town, picking up and delivering food in the Wienermobile. It was great to see so many smiling faces and meet so many kind people. Thanks again for letting us help out! Hopefully we can do it again someday. Again someday indeed. Maybe next year! Jingle, jangle, jingle. Holiday parties and events are in full swing. Do you know what's happening to the leftovers at the events you are attending? Tell the food staff about Food Runners. Food Runners volunteers will pick up the leftovers with a smile and make sure they are delivered to San Franciscans in need. Happy, healthy, hearty holidays to all! Compost, schmompost! Call Food Runners instead. 415-929-1866.